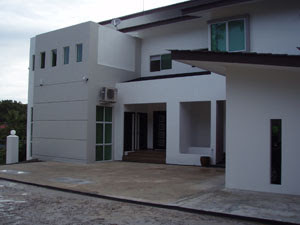 ....how did we (me & my wife) decided to built a modern contemporary house instead of normal typical Bruneian houses? Well at first, we both agreed to built a hill side house since the land is flat at the other end and high on the other end. 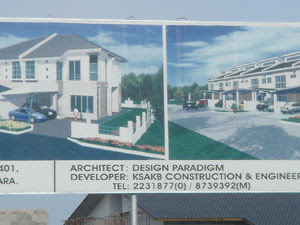 Tanah kami ani rectangle in shape bukan nya square, so a bit limited with house design. So like any clueless people, we window house shopping dari KB ke Muara - taking pictures the houses that we like. That was in November 2004. 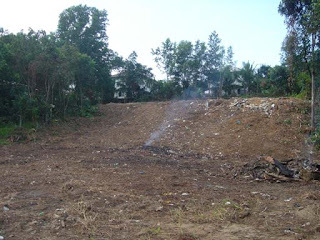 Finally on february 2005, we spotted a developed housing area near Lambak Housing Scheme. 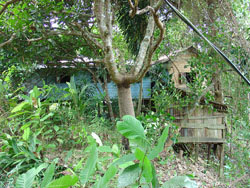 The houses is along the road leading to the Perumahan Lambak Kanan Petrol Station just after tyremart. I saw the big billboard with the architect phone number, so I took the pictures which is much easier and quicker rather than writing it down - takut nanti salah tulis. 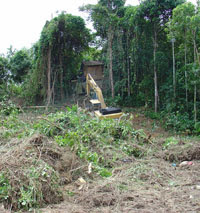 Land Clearance started on February 2005 & construction started early September 2006. 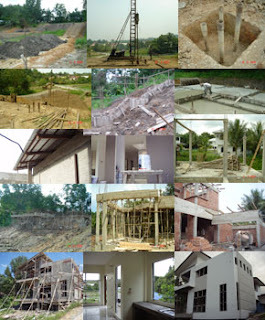 The House was completed a year later, just in time for puasa.